Majesty,marvelous mountain.The earthworm team are taking in the beauty of the gnarled, colourful rocks and the pristine water, The reflections and echoes were startlingly crisp and clear. 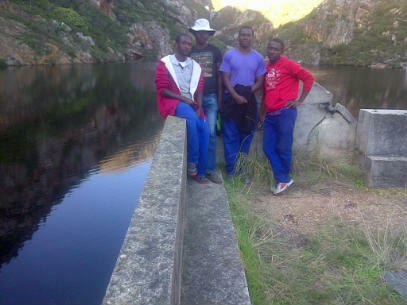 The reward for hard work was a walk up to Three Dams cradled in kloof. Our gardening water originates from this catchment, live energised water. How blessed. To the uninitiated and frequent visitor alike these are reservoirs of beauty.